Winter and the holidays are filled with many symbolic things, like elves, snow flakes, reindeer, and snowmen. Characters like Frosty the Snowman and Jack Frost have stood the test of time and, after every big snowfall, yards are filled with these creatures. Made with coal, buttons, and even carrots, they are truly a homemade creation. Instead of dealing with the cold weather and the eventual melting of your snowman, let the creation live on forever through a papier mache snowman. Blow up three balloons. They should be relativity the same size, with a bigger one for the base of the snowman, a smaller one for the head, and one blown up in between the two sizes for the body. Set the balloons up on some sheets of old newspaper. Create a papier mache mix by mixing 2/3 water and 1/3 flour into a bowl. Mix it well so that it is smooth and not chunky. Cut strips of old newspaper about 3 inches long and 1 inch wide. You do not need to measure out the pieces; that is just a general length. Dip the strips of newspaper into the papier mix and then layer them over the three balloons. Layer each balloon twice to make sure that everything is covered and it will stay strong. Let the papier mache mix dry for 10 to 12 hours. Usually, drying overnight is the easiest way to do this. Paint all of the pieces with a solid white paint. Use two layers of paint so that the layers are a solid white. Let the paint dry for an hour or so. Decorate the middle of the snowman&#x2019;s body using a black marker to draw on coal buttons. You can get more detailed as well, creating pockets for the snowman or drawing other things. Cut out two arms using brown construction paper. Attach the arms using scotch tape on each side of the snowman. Decorate the face using multiple colored markers. Cut out a thick strip of orange construction paper and roll it into a cone shape for a replica carrot nose. Attach it using glue or tape. 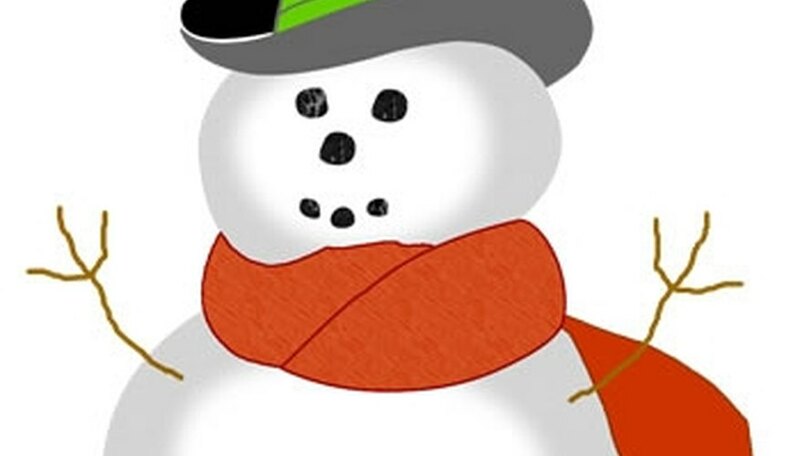 Apply glitter glue all over the snowman to give it a more appealing and noticeable look. Attach the three body parts together using a large amount of superglue in between each piece. Hold the pieces down to make sure that the snowman is secure. Display your snowman during the winter season for everyone to see. Instead of just drawing buttons, you could actually glue pieces of black felt or buttons onto the papier mache body.